Patios and outdoor living spaces in Dallas, TX. However, with all the companies and contractors out there, it is important to choose one that will help you achieve the outdoor living space of your dream. Choosing a reliable Dallas patio contractor can be a difficult task because the final product, whether it is an outdoor kitchen or other outdoor living feature, is basically intangible until the project is complete. If you have been interested in enhancing your patio our outdoor living space, be sure to check out the following six essential tips for finding the best companies when it comes to designing and building outdoor living spaces in Dallas, TX. If you are searching for a local patio design company already, it’s likely you already have a few ideas up your sleeve. Before gathering information on potential outdoor living and patio design companies, first figure out exactly what it is you are looking for. Think about what you will be using your outdoor living space for. Will you be using it solely to enjoy the outdoors more? Or, do you plan on building a space that will be used to host guests and dinner parties? Knowing these little details will be helpful in your search for the right outdoor living design company. Depending on your needs and desires, your outdoor living project expenses can add up. That’s why it is important to establish a budget early on. This will not only help with avoiding overspending, but it will also help you find the best company to meet your needs — big or small, many landscape and hardscape companies are willing to work with your allocated budget while still meeting the needs most important to your project. Search Locally. When it comes to services such as landscaping and hardscaping, you will want to choose a local provider. One of the best ways to find the best local patio designers is to make your online search as specific as possible. Search for terms like, ‘patio contractor near me’ or ‘local patio designers’. Or, be specific to the area in which you live by including it in your search. For example, homeowners in Fort Worth interested in an outdoor kitchen may search, “Outdoor Kitchens Fort Worth,” to find the best companies in that area specializing in that service. Searching for patio designers this way does not just enable you to find the best companies, but also those that are within your community. Ask Family and Friends. Do you know someone who recently hired an outdoor living design company? Talk to them about their experiences working with the company they selected and if they are happy with the outcome. Getting opinions and suggestions from people you know will make it easier to find a reliable designer to work with. Read Online Reviews. There are many online review platforms where customers can share their experiences with companies they have worked with. Try to read a few reviews before making the decision on a company. Now that you have a few companies on your radar, go ahead and look at some of their recent work. Not only will this give you the opportunity to see the quality of workmanship a patio designer offers, but it can also inspire some ideas for your own outdoor living space. Typically, the best place to see pictures of recent work is to look at a companies outdoor living design portfolio. With any home improvement or renovation project, company processes are significantly important when it comes to a professional and stress-free experience for clients. Once you have completed your research and have a few companies to choose from, take a look at their outdoor living and patio design process. Choosing a company that has a detailed and client-involved process will ensure that you will be satisfied after the completion of your project. A good outdoor living design process should help you maximize the available space that you have without breaking your budget. Look for companies that offer 3D design rendering of your proposed project. This will allow you to better visualize the design after installation, so you can ensure you will be satisfied with the outcome. Now that you have found potential outdoor living design companies that offer the design and construction services you are looking for, have great reviews and recommendations, and offer a detailed design process with your needs and budget in mind, it’s time to begin reaching out and requesting a quote. Contact the potential patio designers, providing them with some details about your desired project. Soon, company representatives will reach out to seek more information about your project. This initial consultation is a great opportunity to get a feel for each company, the customer service they offer, and whether or not they are the right fit. Most companies follow the initial consultation with a design consultation, which usually includes a 2D look of your project. By following these tips, you will be better enabled to find the best Dallas outdoor living design company for your desired project. Remember, you’ll want to search for a company that is willing to work with you every step of the way to design and build something that fits your style, your needs, and your budget. If you are looking for contractors specializing in designing and building outdoor living spaces in Dallas, TX, you will more likely than not come across Compass Outdoor Design during your search. 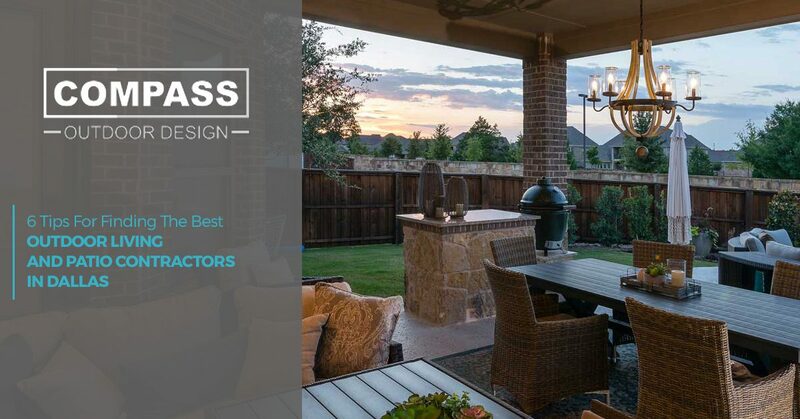 As a Top Rated Local® outdoor designer with a goal to provide clients with solutions to their outdoor needs, Compass Outdoor Design will work with you every step of the way to design and build something that fits your style, your needs, and most importantly, your budget. Whether you are interested in adding an outdoor fireplace, covered patio, or an outdoor kitchen, whatever your desires, our patio contractors work hard to give you the best experience possible. To learn more about our outdoor design services or to schedule a consultation, contact us!